James Leslie Davis was the grandson of Frank Springer, who came to this remote outpost in Colfax County, as president and general counsel for the historic Maxwell Land Grant and who, in 1873, established the CS Ranch. Les father, Warren B. Davis, was a professor of surgery at Jefferson Medical School in Philadelphia, and a pioneer of plastic and reconstructive surgery. Les grew up in Philadelphia, attending Episcopal Academy. 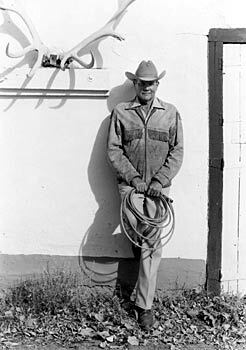 In 1941, just out of premed studies at Dartmouth College in Hanover, New Hampshire, Les decided to spend six months with his uncle, Ed Springer who managed the family ranch at Cimarron. He worked on the ranch, learning the business from his uncle and the ways of cattle and horses from friends and fellow cowboys, Jiggs and Raymond Porter. After the Japanese attack on Pearl Harbor, Les volunteered for active duty and entered the Army as an artillery officer. After training, he went to Europe and crossed the continent as a tank forward observer with the 4th Armored Division. He was awarded a Bronze Star, three Purple Hearts, a Presidential Unit Citation and completed his service as a Captain and Battery Commander. 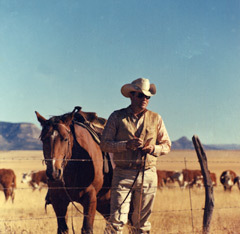 Les returned from the service in 1947, decided his future was in ranching, not in medicine, and took over management responsibilities at the CS. Upon the death of his uncle Ed, Les became President and Chairman of the Board of CS Cattle Co., a position he held until his death. The fact that all their children returned to the ranch after college was a source of intense pride to Les. He was quoted in a Progressive Farmer article in January, 2000 as saying, Our kids have all picked this up by second nature, they all voluntarily came back to the ranch. The subject of youve got to come back and help us run this place never came up. Les was first and foremost a family man. His many years of sacrifice and service to his country, community and industry were important to him, but the ranch and the family were what kept his passion for life burning brightly. A man of many talents and interests he was an artist, musician, magician, horseman, opera aficionado, businessman, sportsman, sculptor, patriot, author and a wonderful husband, father, grandfather and friend. 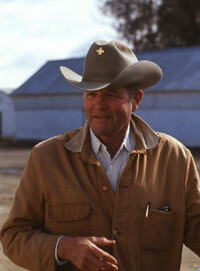 Les Davis was an important part of the fabric of the livestock industry and its culture for more than 60 years. His optimism, his genial, familiar, yet dignified manner, his appreciative wit and his love of nature, history, good horses and really, anything of beauty and grace, rubbed off on everyone around him. He wasnt out to impress anyone, but rather to enjoy them. With Les Davis the good things were elevated to their true status in life; good things were to be savored and dwelt upon. The bad things? Well, to Les these were simply temporary annoyances to be solved and sent to the recycle bin. Les Davis will be missed and his absence will be tangible. But the survival of his legacy is assured in his family, his land and in the hearts and minds of all of us who knew him.